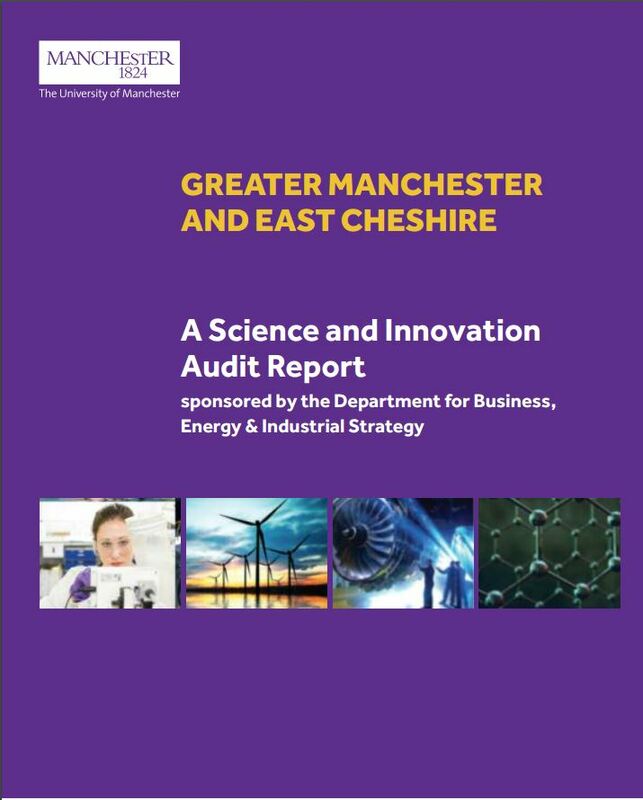 Greater Manchester and East Cheshire have formed a consortium to identify and focus on the major strengths of the region of health innovation, advanced materials, energy digital, and industrial biotechnology. Their vision, of driving synergies among these strengths to create added value applications in new technologies, will be delivered through inter-connectedness and linking of clusters of excellence. Health Innovation – £28.5 Biomedical Research Centre, Manchester Cancer Research Centre, Alderley Park Science Park, and Citylabs. Advanced Materials – Sir Henry Royce Institute, National Graphene Institute, Graphene Engineering Innovation Centre, BP International Centre for Advanced Materials, Cockcroft Institute. Energy – National Nuclear Laboratory, Dalton Nuclear Institute, and National Grid High Voltage Laboratory. Industrial biotechnology – Manchester Institute of Biotechnology, and Waters Corporation’s Mass Spectrometry Facility, . Health – Linking the largest cluster of health research excellence outside the South East, a large and stable population exhibiting significant health challenges, and health devolution and Health Innovation Manchester with the digital sector (eg health informatics) will allow for becoming a global leader in clinical trials. Materials – Creating a pathway for new innovative materials, as well as a skills base to develop and apply them, will link the National Graphene Institute, which is engaged with business and producing start-up companies, with the Graphene Engineering Innovation Centre to turn discoveries to applications. Technology Testbed – Fast-growth opportunities, digital and energy, benefit from large-scale smart-city demonstrators, such as CityVerve and Triangulum, whilst industrial biotechnology, strengthened by the concentration of related industries in the North of England is focussing on sustainable and resilient alternatives to fossil fuels and feedstocks. Education – whilst the region has globally competitive multi-national companies and SMEs in each sector, and a higher than average proportion of the area’s workforce employed in research professions, a significant share of the population has no qualifications at all. Innovation – Whilst locally knowledge transfer and leadership is strong, nearly half of companies across the region are not ‘innovation-active’. Productivity – productivity and average annual full-time pay remains below the England average. Strategic investment to capitalise on the key intersections and opportunities – Pankhurst Centre for Research in Health, Technology and Innovation. Strengthen the innovation support ecosystem – enhance collaboration, nurture talent and improve business support.